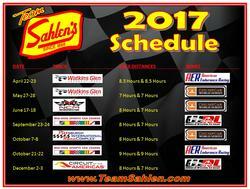 Team Sahlen has set their preliminary 2017 race schedule. There will be 7 events with 14 races throughout the season. From these 14 events, there will be over 100 hour of racing on track. If you include the aspect that there will be 2 entries per race, and a 3rd entry at several events, then Team Sahlen will be on track a combined 250+ hours for the year. Similar to last year’s schedule, the season will include a montage of events between three different series: American Endurance Racing, ChumpCar World Series and World Racing League. There will be 7 events with 14 races throughout the season. The 1st event of the season will be in April for the Sahlen’s Sports Car Springfest at the Glen with the American Endurance Racing Series. Team Sahlen will be defending their 2016 victory at this event. The team has added a 3rd Porsche Cayman to increase the potential for this race. Team Sahlen tested this Cayman at the Fall 2016 American Endurance Racing event at Mid-Ohio to prepare for the coming year. The team will make a 3rd straight year visit to American Endurance Racing’s season finale at the Mid-Ohio Sports Car Course in October. Team Sahlen has competed in the ChumpCar World Series since 2011. In that period of time, the team has relied upon the everlasting strength of rotary power from their Mazda RX7s to race to the front of the pack. In 2016, Team Sahlen was able to lead 6 ChumpCar events, with a victory at Gingerman Raceway as the capstone to ChumpCar chaptert of the season. The 1st event with the ChumpCar World Series in 2017 will be at the Memorial Day weekend Sahlen’s Chumpyard DOG at the Glen event. The next event with ChumpCar will be in June at the brand new National Corvette Museum Motorsports Park. The final 2017 event with the ChumpCar World Series will be at Pittsburgh International Race Complex in October. At this event in 2016, Team Sahlen led the 7 hour event all the way up to 2 laps to go, when a broken exhaust pushed the team back to 3rd place. Team Sahlen will most certainly be marking this event on the calendar for redemption over the prior year heart break. Last season marked Team Sahlen’s debut in the World Racing League. The team was fortunate to be able to win in their inaugural event with the series at Gingerman Raceway. In this event, Team Sahlen campaigned their Mazda RX7s to victory. For 2017, Team Sahlen will be switching mounts to their Porsche Caymans for the World Racing League events. The 1st event on the World Racing League circuit will be in September at Mid-Ohio Sports Car Course. Here Team Sahlen will be hoping to utilize their home track knowledge to have an edge on the competition. The final event on Team Sahlen’s calendar will be in December at World Racing Leauge’s US Endurance Championship at the Circuit of the America’s. eEuroparts.com, Tarett Engineering, Guard Transmission, Porsche of Beachwood, Pittsburgh International Race Complex, HubstandsPRO, Brothers Grimm Landscaping, NGK Spark Plugs, CM Racing Products, Mothers Polishes, Grassroots Motorsports Magazine, Design Engineering Inc., Hard Brakes, Alcon Rotors, Lamin-X, Optima Batteries, Mazdaspeed and TheRaceSite.com.